“I cannot, in all good conscience, support a deal that would be detrimental to our nation’s interests,” the MP said. TORY MP GARETH Johnson has resigned as the government whip. In a letter published this afternoon, he said that he has concluded that he “cannot, in all good conscience, support the Government’s position when it is clear that this deal would be detrimental to our nation’s interests”. Like you, I am not only a Conservative but I am also a committed Unionist and I cannot accept the additional regulatory compliance required of Northern Ireland that would set it apart from the rest of the United Kingdom. MPs are poised to reject British Prime Minister Theresa May’s Brexit deal. On the eve of tomorrow’s monumental vote in parliament on her withdrawal agreement – forged from 18 months of gruelling negotiations with European leaders – May addressed factory workers in Stoke, a Brexit-backing city in central England. The embattled leader, who is widely expected to lose the House of Commons vote by around 100 votes, made a final bid for support it by arguing: “We all have a duty to implement the result of the referendum. “I ask MPs to consider the consequences of their actions on the faith of the British people in our democracy,” May said. “What if we found ourselves in a situation where parliament tried to take the UK out of the EU in opposition to a remain vote?” she will ask. Theresa May needs the support of 320 MPs: the Tories have 315 elected members, and the support of 10 DUP MPs. But after over 100 MPs voted against her during the motion of confidence in December, it looks likely that her Brexit deal won’t pass next week. 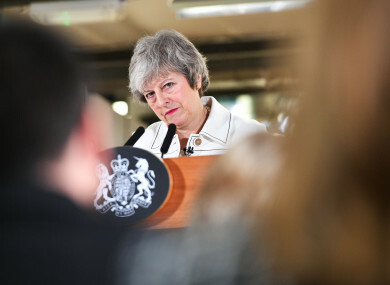 If it doesn’t pass, the options are both endless and equally implausible: further negotiations; extending Article 50; a general election or a Tory leadership challenge; a second referendum or a no-deal Brexit have all been floated as possible scenarios. Many MPs, including the DUP who are supporting Theresa May’s Tory government, oppose the Withdrawal Agreement because of the backstop, which proposes aligning Northern Ireland with the European Union rules if they cannot agree to a better plan in the next phase of negotiations (assuming we get that far). The vote on May’s Brexit deal will take place at 7pm tomorrow. Email “Government whip resigns over the backstop on the eve of the Brexit vote”. Feedback on “Government whip resigns over the backstop on the eve of the Brexit vote”.